<font color="green">"The car is Yenko # 8016, and, sold new at Jay Kline Chevy to Bob Krueger. In a letter, he explained how he went to the dealership in late '68, and, had a choice of two Rallye Green, and, two "light blue", Yenkos. After test rides, he chose this car, and proceeded to street race it extensively in the Minneapolis area. He claims he was "never beaten", and, the only car that came close was a '70 Hemi Cuda that he raced on I 35, all the way up to 130 MPH. 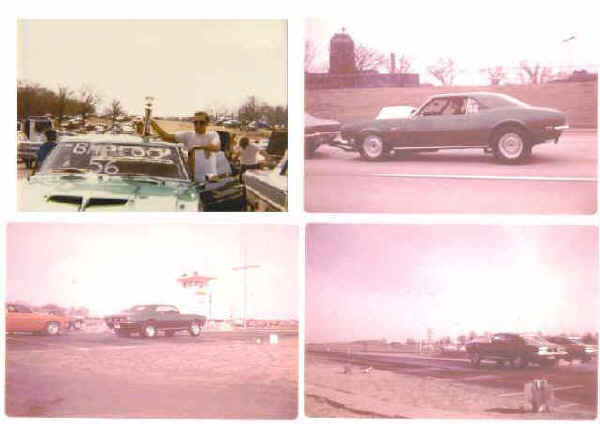 He sold the car to his brother who removed the stripes, and, Yenko badges, but, left the SS 427 emblems that Bob had installed when the car was new. His brother installed dual Holleys on a tunnel ram, and, "Grumpy lump" style hood. At that point the car was raced only on the track. Some years later, mnyenko [Earl] on this site, discovered the car sitting outside a body shop, but, was unable to come to terms with the owner. Some five years later, after the stock market slumped in 1987, Earl was able to finally buy it for the same price that had been asked before. 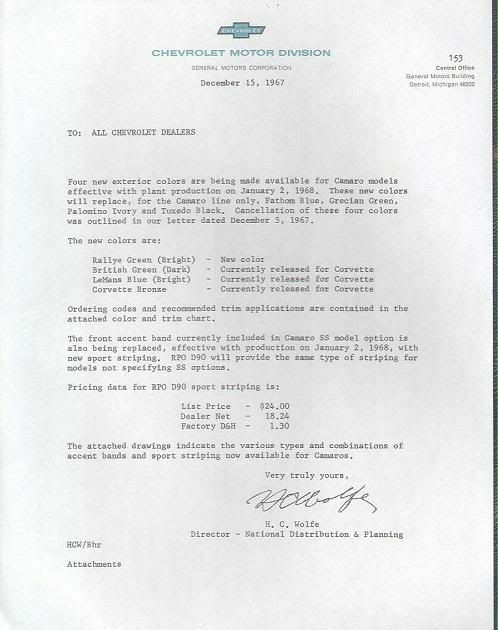 Later, Earl sold it to a buyer who sent the car to Gene Schmidt to be restored." "The car was extremely solid, but, needed the usual drag car quarter replacement. For some strange reason, the paint supplier used the early '68 code of British Racing Green, and, the car was painted the wrong color. The car was completed, and, shipped to the owner in California, who enjoyed the car for a while, until he took it to a show, and, was informed by an "expert" that his car was "the wrong color". Well, the stuff hit the fan, and, eventually, he was refunded $6000. to get the car repainted correctly. Unfortunately, since the car looked great, even though it was incorrect, the owner never had it repainted." Mike Mahalo for bringing this 68 to SCR7. Being a person that is more of a 68 Camaro guy myself, I enjoyed seeing a car I had heard so much about finally in person. as for the color, Nice to see it back to what it should be but either one looked great on that car. Heres a little info you might like to print out about that subject as well. What are the Dates &amp; locations of those four Vintage pictures? As good as it looks in Rallye Green, I dig the British Green look. Hey I really like the new Supercar Forum Rob...we can finally comment right here in it's own thread....sweet car Mike...I saw it in British and I saw it in Rallye....I like em both but the Rallye is striking on it. I really like the old drag decals on the quarter glass !!! This was one of my favorite "new cars" at SCR7...Until then I had never seen a rally green 68 Yenko Camaro, aside from some original photos I have that were taken in Canonsburg in 68. Did you happen to get a chance to see them? I was curious if it could possibly be the same car. If i get some time tonite i will try to post a couple here. Rally green is definitely a cool color...Does anyone know how many Yenkos were done in this color in 1968? Come check out the all new, all Chevy online swap meet! Can't go wrong with rally green. Excellent car Mike! Great car and interesting history! Very nice car and interesting history! !